Photo and text by Gabrielle. I am wondering if you would post regarding how you manage rules around electronic devices and your children. Recently, several moms and I were together for dinner and this topic kept us occupied for several hours. I have kids ranging form 17 to 9 and it is getting harder and harder to manage what one can do and the others cannot do. I think a topic on this would be of great interest to so many of us out here looking to hear what other families have found works for them. Many thanks! — Rosanna S.
Terrific question, Rosanna! I agree — hearing how other families are managing things is so helpful! And you’re not the only one with this on your mind. I get questions about kids and screen time weekly. So much so, that Ben Blair and I even covered this topic in one of our first Periscope broadcasts. If you missed it, I posted the video online here. Instead, we try to focus on the positive aspects screens bring to our home. For example, our iPad in the kitchen has enabled us to try tons of new recipes easily and on the spur of the moment. Services like Skype and Facetime keep us connected to family and friends from all over the world. Our kids use screens for coding tutorials, for foreign language learning, and creating art. And when we’re having a family discussion about a current event, being able to look up facts or figures about it as we talk — having endless libraries of information at our fingertips — is one of the biggest miracles of modern times. We don’t make enemies of the screens. We start by focusing on what awesome tools they are. We put a lot of responsibility on the environment in our home. If screens are the most tempting thing in any room of our house, then we have a pretty crummy house. Instead, we think about what activities we want them to do, and then make sure it’s really easy and appealing to do those activities. For example, art supplies are easy to access. We have a cozy reading crammed with books for all ages. We make it easy to use the kitchen — even for the little kids. We keep the board games at their fingertips. The dress ups are on display. And we make the outside of our house — our yard, the swings, the hammock, the trees, the jump ropes, the pull-up bar — as inviting to the kids as possible. The idea is that we make sure our home, and how we’ve set it up, facilitates the activities and conversations we want to promote. 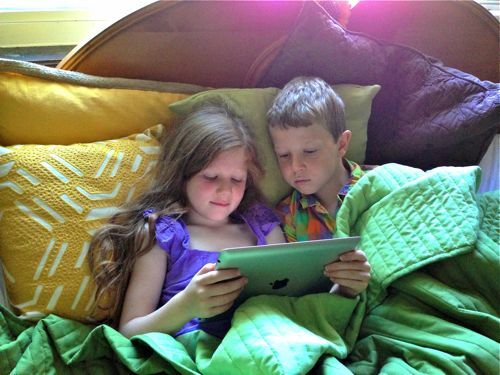 For example, at our house, we made a rule that we would collect all portable screens every evening and charge them in our bedroom (so that the kids aren’t tempted to sneak them into bed). This rule works great when we are enforcing it! But if we’re too tired/lazy to collect the screens, then (surprise!) it doesn’t work so well. Though I said this is the hardest, the good news is, it gets easier. Good habits eventually form! These notes cover our current strategies, but I want to be clear: just like everyone else, we are figuring this out as we go along. Parents everywhere with screens in the home are having to tackle this. There is no historical precedent, and we don’t have a thousand case studies of families that have already handled this successfully to look to. It’s just so new! So with that in mind, please share what you’ve tried at your house, or if you’ve heard of a family that has a screen policy you admire. We want to hear! P.S. — If you’re wanting more on this topic, our video goes into greater detail. We deal with screens similarly to your family. We don’t make an enemy out of screens. Yes, they can be used for fun. We all love a good game of Stack the States. But they can also add value to homework assignments (what’s the difference between a mean and a median again?) or just basic curiosity. I can’t tell you how often we’ve used it when my kids have asked a question I don’t know. “Mom, does a mouse hibernate?” “Gee, I don’t know dear, let’s look it up.” Because we keep an Ipad handy during the day, we can easily Google the answer. At night it goes on the counter in the kitchen. We don’t have a problem with anyone sneaking it at night, but if that becomes a problem we will adjust our system. We are more lenient with “fun” screen time in the winter when the early darkness and bitter cold keeps us inside. During the summer, I encourage my kids to get outside and play. Last week I asked my son to run around the house 3 times before he could watch a favorite cartoon on Netflix. The only strict rule we have, is that only Mom or Dad can add an app to the Ipad. I agree with your attitude about embracing the screen. My husband and I both have a variety of devices and my 8-year old has a kindle. These have helped connect us in too many ways to count and we use them daily for education and entertainment. It’s all about moderation. There are times where we need to use them more and then times when we barely think about them at all. I’m a high school teacher and all my students are issued laptops that they use for their junior and senior year. I can’t even begin to tell you what a difference this has made in my classroom. We can all look things up together, I can have them access websites and work on online assignments, they submit all their assignments to me online and can follow powerpoints and lectures more closely. They don’t waste those inevitable down times and can work on college applications, other homework or read the news. There are definite drawbacks,, but I think your three rules cover the guidelines and are just as applicable to the classroom as they are at home. I agree about not making screens the enemy. They are just a tool and can be used to our benefit or not. I find that the two best ways to avoid over using screen time are 1. having a schedule for homework, meals, family board game time, and other screen free activities/priorities. It just becomes a habit that these times don’t include screens. 2. Rules for when the screens are off limits and when they are acceptable. For instance my son knows that he will get tablet time during my daughter’s soccer practice. Since he knows he’ll get some screen time then he’s not as likely to complain during the times when it’s “off limits.” Recently I read the book The Learning Habit that offered additional information about different types of media use such as creation, consumption, and communication. I found these distinctions interesting as well as helpful. I’m curious what kinds of parental controls you use or software that tries to ensure kids can’t access inappropriate content? Has this been a challenge with such a wide spread of ages among your children? Our kids are five and two and we don’t own a TV, so our only screen is my smart phone and the laptop. My phone is an older phone so there is no games and I’ve never let the kids touch it so they don’t even associate it with being a toy. And the laptop can play a movie, and our rule is they get to pick a movie on Sunday and thats it. It’s super simple, they ask what day it is, sometimes they ask if they can watch a movie and all I have to say is, “Is it Sunday?” And they go right back to playing. Before when they could watch a movie it was whenever I felt like it so we had two world class whiners on our hands. This is much nicer for my ears. I will also admit that when they get older I realize things will be very different. But now I subscribe to the “Go outside. Go play” method of parenting and I’m hoping it will be so ingrained in them they won’t want screen time as much when they are older. One can only hope right?! Our guidelines are really simple: no screens during the week. We are just too busy, frankly! By the time school is out, piano practice is done, chickens are fed and outside play is wrapping up, dinner is made — our daughter has just enough time to draw or read for awhile before bed. We’ve found that movies or iPad games during the week really affect her sleep patterns and her ability to focus and employ her imagination to get out of “boredom.” And her teachers have strongly requested that the children don’t watch cartoons or play video games before school, as it takes them a long time to bring the class attention together otherwise. We attend a Waldorf school, so they don’t have technology in the classrooms until 7th grade — when they start by taking apart and rebuilding a motherboard! On the weekend, she can watch a movie or maybe even two. And she’ll occasionally ask for iPad games, which we choose thoughtfully. They must have visual beauty and what I call “narrative value” (some kind of thoughtful purpose or goal, not too frantic in graphics or music, generally aesthetically lovely and interesting). And we’ll enjoy movie nights together, as well. We’re slowly getting into stopmotion, and that’s where I feel technology can be wonderful — when it’s used as a creative tool! As long as she also using materials she can touch, smell, and manipulate with her hands, technology for creative play is great. Oh yes, one more thing — we have always kept games off of our phones, and don’t bring screens in the car (the iPad can be used for audiobooks on long trips). We really wanted our daughter to learn how to sit in a restaurant lobby politely, look store clerks in the eye, be patient and outwardly curious — without a game in her hand. And we want her to look out the window and see the world when we’re in the car — plus those invaluable conversations from the backseat! I knew early on that as soon as I started using the phone to “entertain” her, it would become a big problem — for me! I would use that as a crutch all the time! So I completely banned it from my parenting toolbox for years, and now I don’t often even think about it as an option.